I stood there on the dock with my clients, discussing our options. It was February and a blustery winter wind was blowing out of the northwest. “Let’s give it a try”, I suggested. “If we are cold and miserable, we will just come back in”. I grabbed a bunch of live shrimp and idled north towards Phillippi Creek. This area has a lot of structure including oyster bars and docks, along with some deeper water. It is also protected from the wind. We anchored up-current of a bar with a drop off into 4 feet of water, tossed out a few pieces of cut up shrimp as chum, and cast out a couple of live shrimp on a #1 hook. It wasn’t long before the unmistakable “tap” of a sheepshead was felt. My client waited until a solid pull was felt and reeled quickly while raising the rod tip. The feisty sheepshead was soon landed and placed in the cooler. These striped crustacean-eaters make terrific table fare! Over the next several hours we landed over two dozen sheepies to five pounds, and I never even put the boat on plane. Once again, Siesta Key sheepshead saved the day! 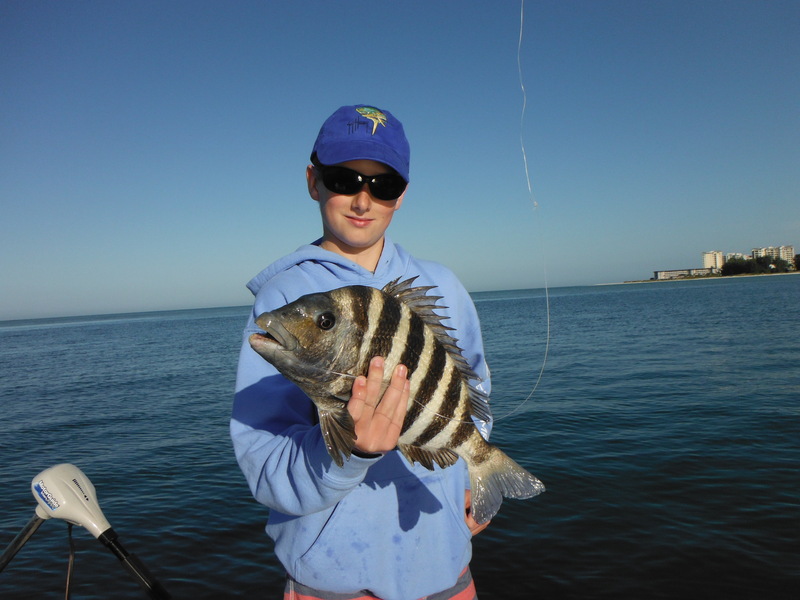 In my opinion, sheepshead are an undervalued gamefish, I persue them regularly on my fishing charters. They fight hard, bite in cold and dirty water when other fish shut down, grow fairly large, and taste great. What more could an angler ask for? They offer a viable and much more cost-effective alternative to offshore bottom fishing. By February they are thick around just about any structure on the north end of Siesta Key in Big Pass and the docks along Bird Key. All of the area bridges, particularly the Twin Bridges going over to St Armands Key, are reliable spots. One element of Siesta Key sheepshead fishing that I enjoy is the simplicity. It really does not get any easier than this. 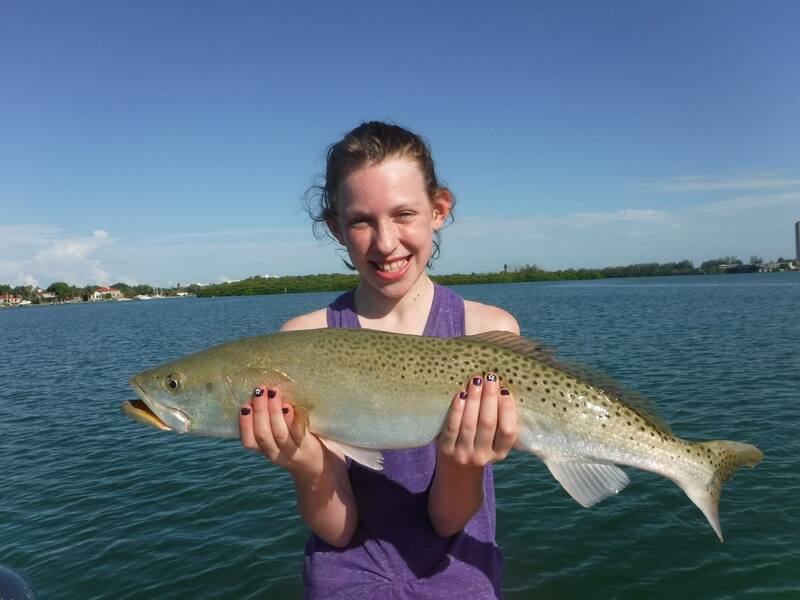 However, as in all fishing techniques, there are nuances that will increase an angler’s chance of success. Twelve to fifteen pound spinning tackle is ideal, the extra little bit of muscle may be required if larger fish are encountered. The terminal rig consists on a two foot piece of thirty pound shock leader, a little bit of weight, and a #1 or #1/0 live bait hook. In shallow water or when little current is present, a split shot is usually all the weight that is required. When fishing deeper water or in heavy current, a “Knocker rig” can be very effective. This consists of an egg sinker that slides on the leader and rests right on the hook eye. This keeps the bait right on the bottom while still allowing a fish to move off a short distance without feeling any resistance. Live shrimp are the most popular and easily obtained bait. Fiddler crabs, oyster worms, and sand fleas are terrific baits but are not available at local shops and must be caught. CB’s does keep frozen sand fleas and shrimp on hand. While many anglers prefer large shrimp for inshore fishing, in this application the smaller ones can be more effective. Sheepshead have a small mouth; a bite-sized shrimp is perfect. Hooking the shrimp just under the horn is generally the most effective presentation, but if a lot of bites are missed, threading the shrimp on the hook shank should limit the number of missed bites. 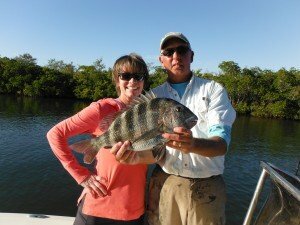 Boat positioning can be critical when Siesta Key sheepshead fishing, particularly in a swift current. Anchoring a short cast up-current from the structure is almost always the best approach. 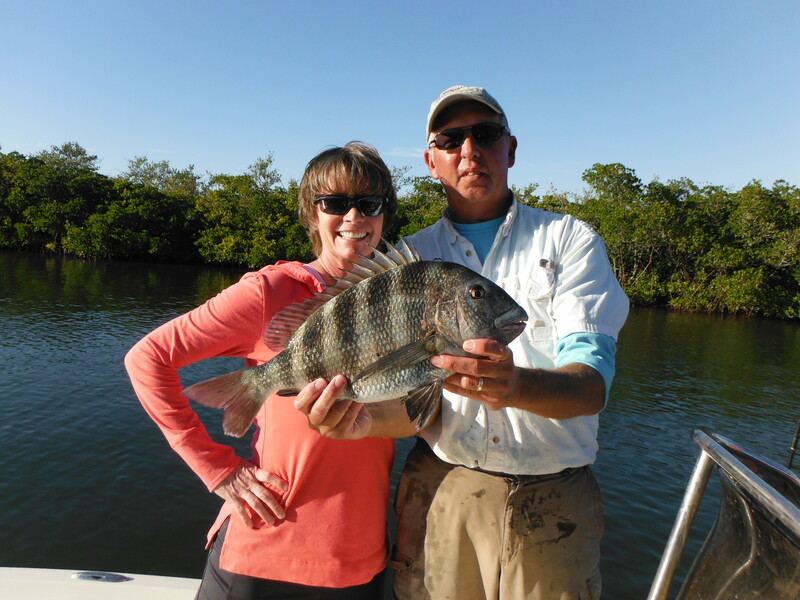 The northwest tip of Siesta Key is a terrific sheepshead spot. The water is over twenty feet deep with a lot of fish-holding structure. This spot is best fished on a slack tide using a vertical presentation. There is an old saying regarding sheepshead fishing; “set the hook just before the fish strikes”. Of course, that is a joke, but the reality is the take can be very subtle. I have found the following technique to be the best for hooking these delicate feeders. Cast the bait out and allow it to settle on the bottom. Reel up all the slack and keep the line barely tight, but do not move the bait at all. Often times it will begin with a light tap or series of taps. It is crucial to keep the bait perfectly still; moving the bait will usually spook the fish. Wait for a steady pull, then reel quickly and raise the rod tip. The hookup ratio will never be perfect and plenty of bait will be lost to these bait-stealers, but a lot of fish will be caught, too!